This product is a great resource to use with Houghton Mifflin Harcourt Journeys (grade 3). It can be used for classwork or homework. 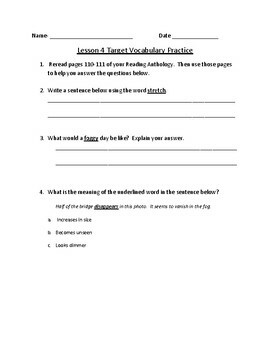 Each page has three vocabulary words and has the student use a vocabulary word in a sentence, write a response using a vocabulary word, and answer a multiple-choice question about a vocabulary word. **Also sold as a complete set.